The last seven months have been incredible. 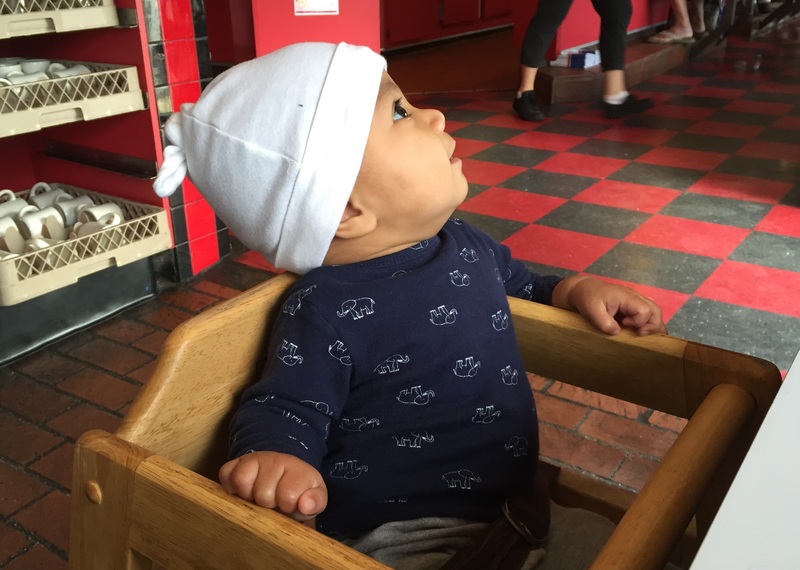 Jackson is learning so much, and he seems to reach a new milestone every few weeks. We took our first family vacation (to Maui). We rented a condo by the beach in Kihei an enjoyed lots of poke and sunshine. Jackson did not go into the ocean, but he did take a dip in the pool. I returned to work. Jackson gets to hang out with his nanny Elizabeth during the day. He loves her and she is teaching him so many things. Paco and I ventured out on our first date night since Jackson was born. 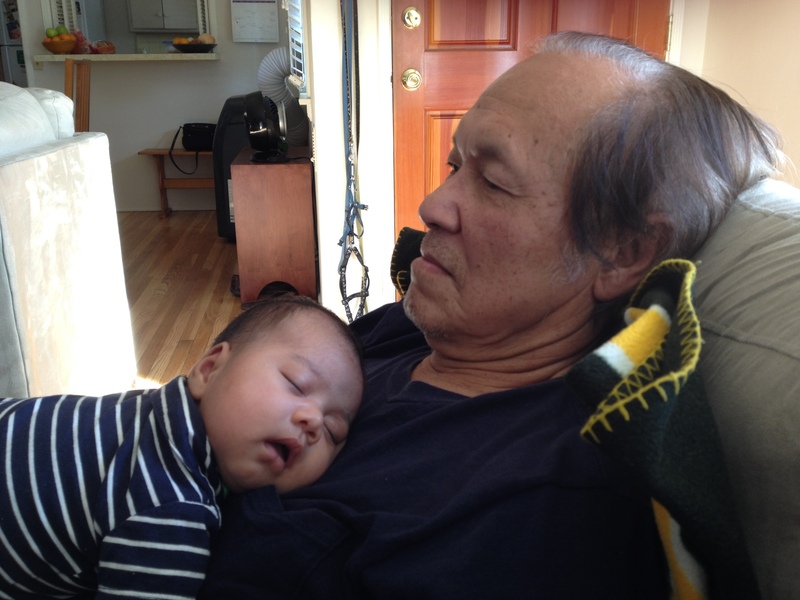 For my birthday, Jackson stayed home with Grandpa while we went to omakase (yum). My birthday present from Paco and Jackson was a professional family photo shoot. It was so much fun, and it is great to have pictures with all three of us in them. 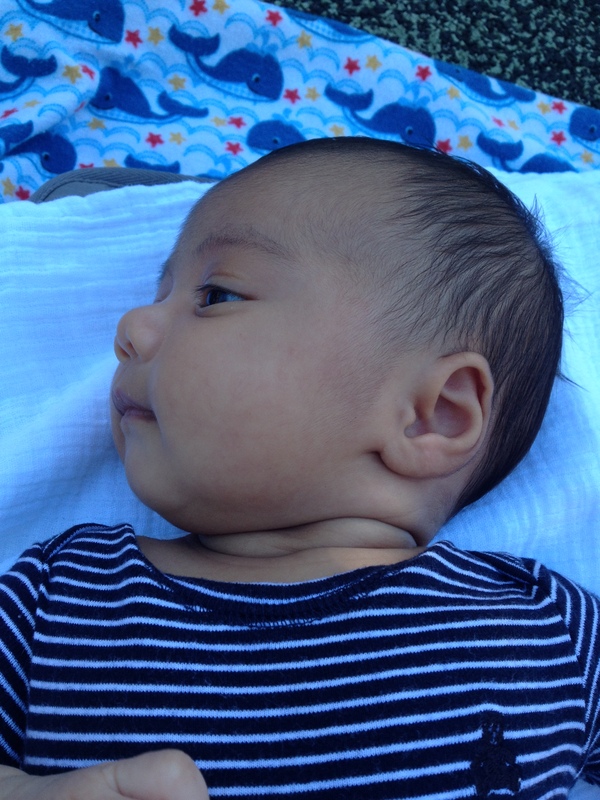 Jackson went on his first road trip, to to Santa Cruz and San Francisco. 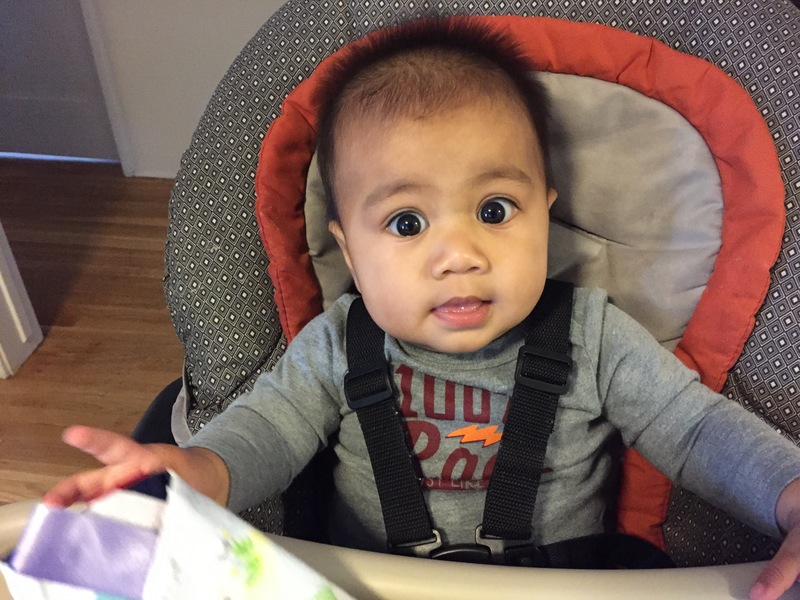 Also at 6 months, Jackson could sit up on his own (using hands to balance), he could get up on all fours and scoot around (not quite crawling), and he said, “mamamama”! 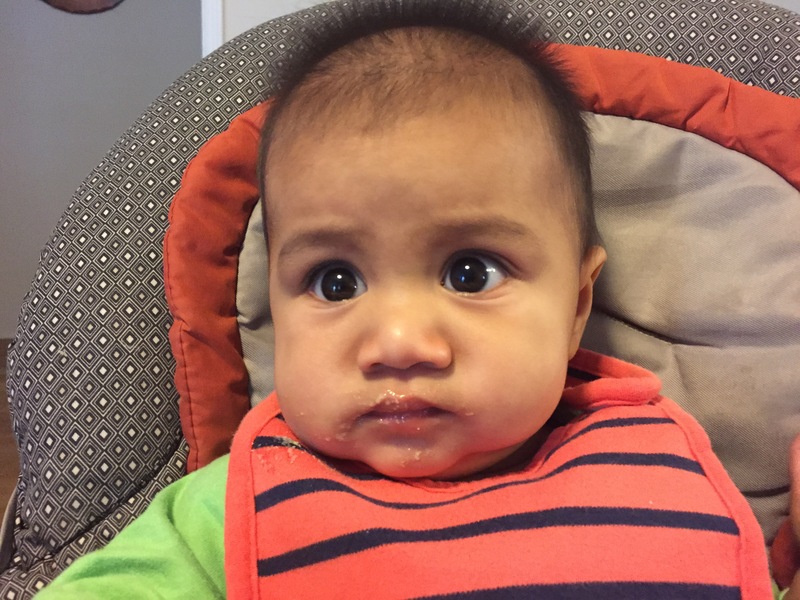 We also introduced him to solids at 6 months. . .he loves mango, oatmeal, green beans, carrots, pears . . . he is natural eater. 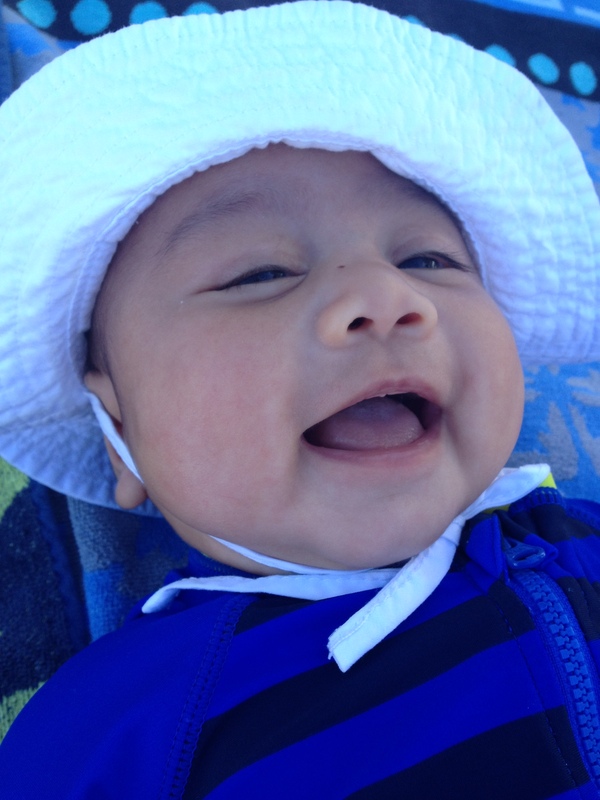 His first tooth appeared on his 7-month birthday, which also happened to be Mother’s Day. It was a Mother’s Day miracle! He can sit up on his own and is getting pretty good at scooting around. Next month we are taking him to Palm Springs for the weekend. I’m excited for Jackson’s second pool adventure! 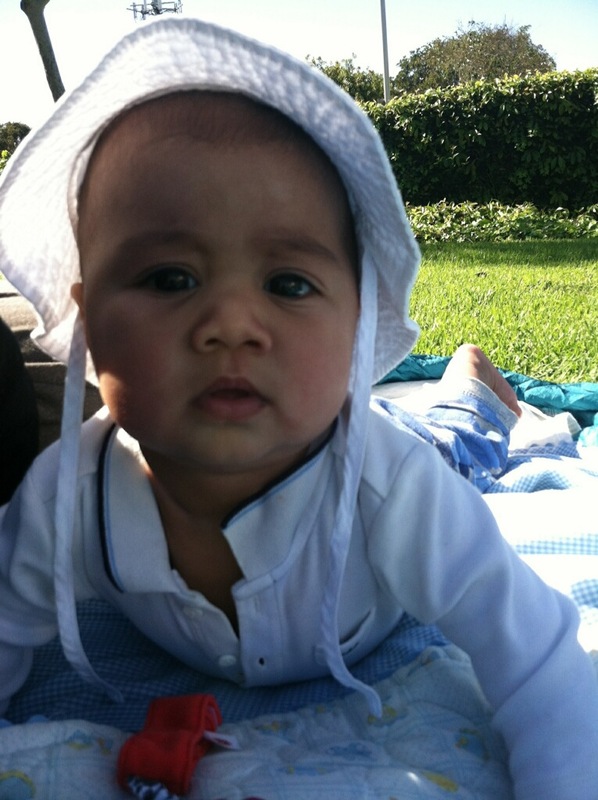 Jackson was born on October 10, 2014. The first eight weeks have been so exciting and rewarding, and of course, challenging! Honestly though, I was expecting life with a newborn to be incredibly difficult (and the first three weeks are still a bit hazy), but Jackson is a very relaxed, sweet, and healthy baby. I’ve been trying to live by the “fourth trimester” philosophy of not relying on schedules and just letting Jackson eat when he’s hungry, sleep when he’s tired, and so on. 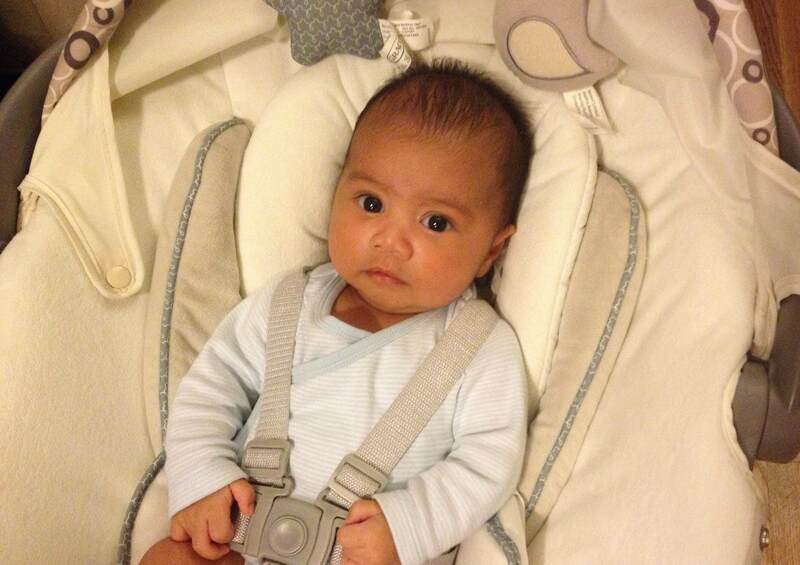 It definitely made the first few weeks much easier, although now we can usually figure out what he wants. Lando and Rascal have adapted to life with Jackson very well. We started preparing them while I was pregnant. Rascal can’t jump onto the couch, so we stopped lifting him onto the couch whenever he wanted. He got used to sitting on the rug by our feet. It is very sweet, actually, he tends to sit by the feet of whomever is holding the baby. Lando has gotten more patient waiting for walks (at least with me), but we are still working to reduce his barking! Luckily Jackson is not terribly disturbed by barking chihuahuas. 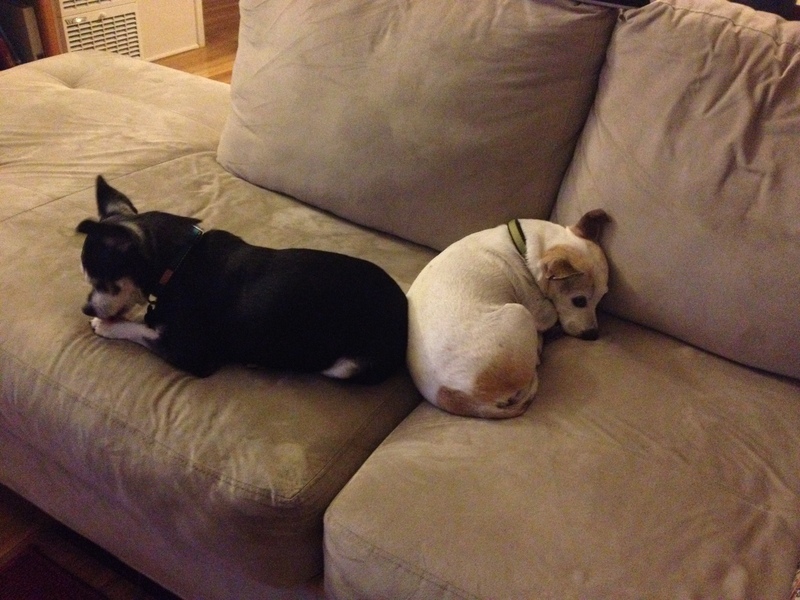 I’m glad that Lando and Rascal have each other for company, as I am less available to pet and snuggle them. That is just temporary, though! Company! Paco stayed home with me the first 5 weeks. My dad visits most days, and we had a lot of friends and family visit during those first weeks. Short visits from the outside world are very refreshing. Support. Breastfeeding can be much harder than most new mothers realize. 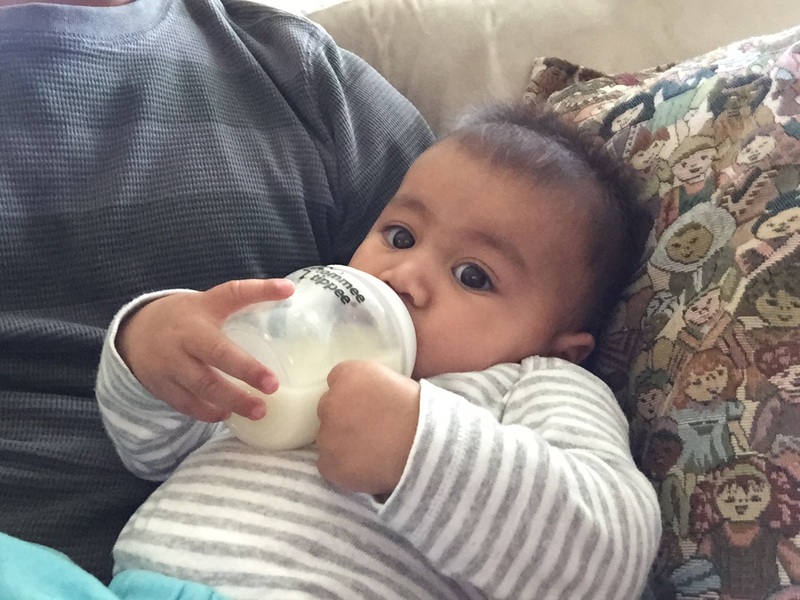 Jackson and I have had a relatively smooth ride, but I found that going to a lactation support group was immensely helpful. Even if you think things are going well, they are full of insights that can make it even easier and make you more comfortable and more mobile. 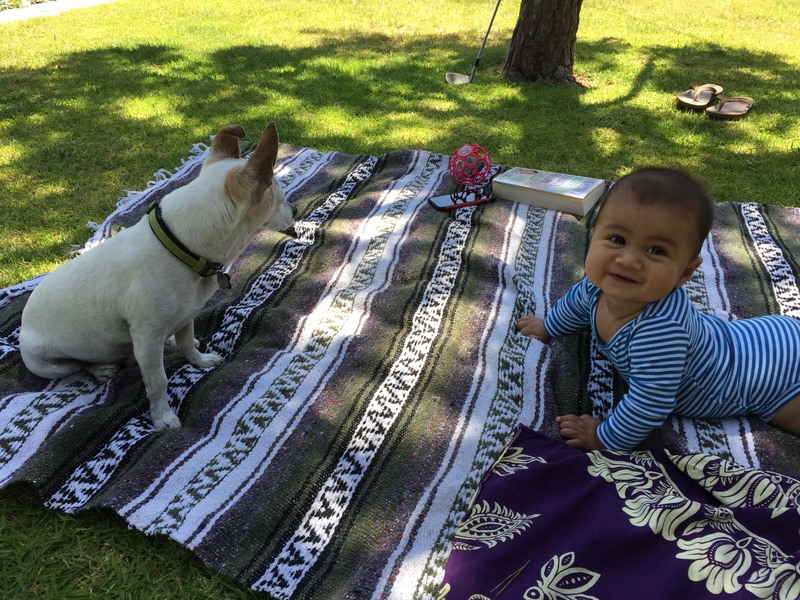 I have also been going to La Leche League meetings, which is great for the sense of community (Jackson is hanging out at the park in the picture below). Baby carriers. Jackson loves to be carried in a carrier and walked/bounced/danced around. The Ergo (pictured below) is awesome for going out and longer walks, and I have a ring sling which I wear around the house, and which is perfect for throwing in a diaper bag. 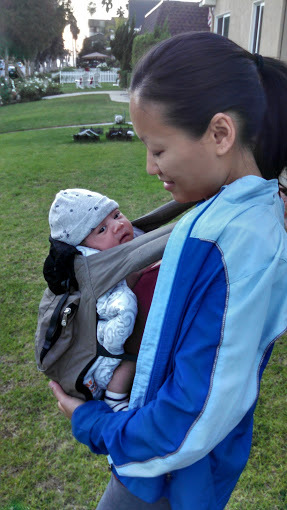 In general, I feel much more comfortable taking him out in a carrier than the stroller at this point. It’s one less thing for me to worry about, and if you’re going to stores, it doesn’t involve taking the stroller in and out of the trunk. Paco and I are not very focused on interior design. We like things to be comfortable and functional, and most frequently disagree about the amount of “stuff” around (I like less, he likes more). With Baby Flores’s nursery, I think we came to a nice happy medium. I hope that the little guy likes it when he gets here! 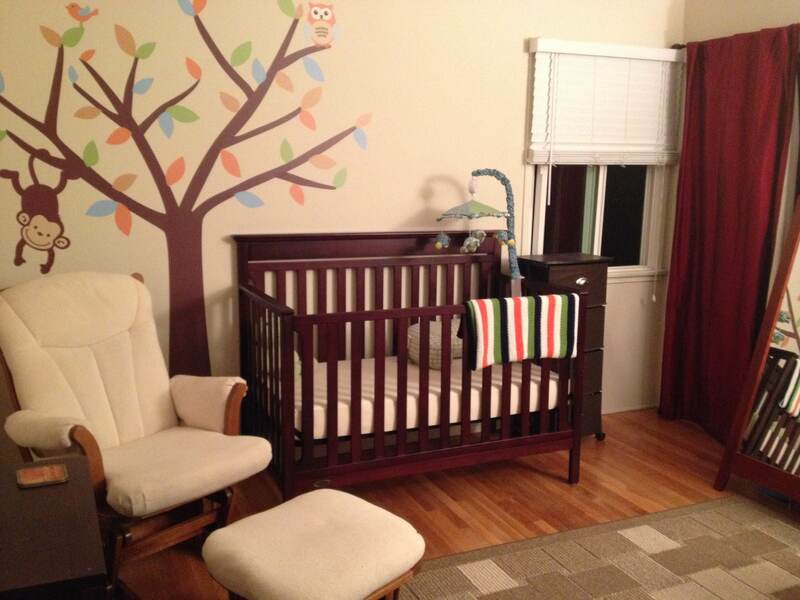 We wanted a boyish room without making it too gender-specific. We did not initially intend to have a theme, but we ended up choosing lots of animal pieces so we sort of have an animal theme going. I love it! Crib – We opted for one with clean lines and plenty of ventilation. If he’s like his mom, he will run warm at night. 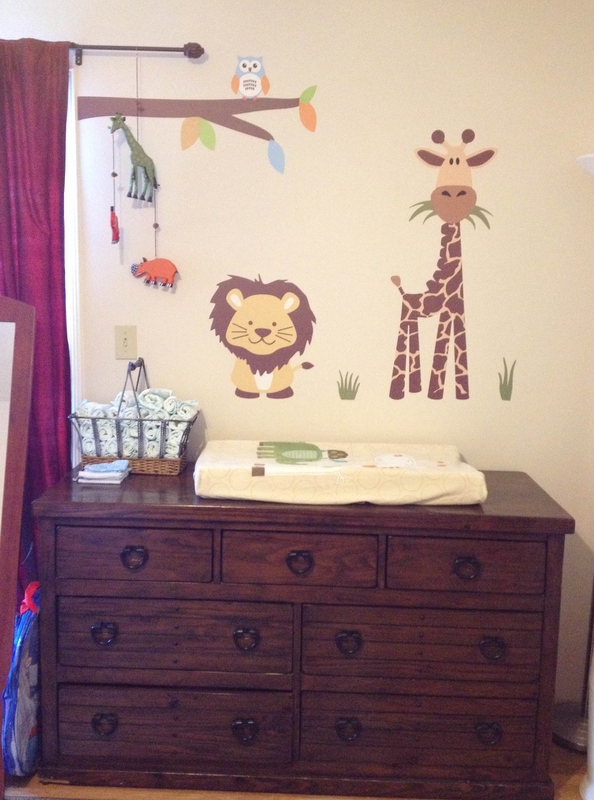 Changing table – I wanted to avoid baby-specific furniture as much as possible, so we added a changing pad to our regular dresser. Glider – I wasn’t sure we’d need one, so I was reluctant to purchase one. However, we inherited this one from Paco’s generous colleague, and I’m so glad that we have it now. It’s super comfortable with back support and a place to put my feet up. Night stand with a lamp – I think this will be convenient, especially for middle-of-the-night meals. With less than a week until my due date, I think we are pretty ready for his arrival! I can’t wait to meet him.